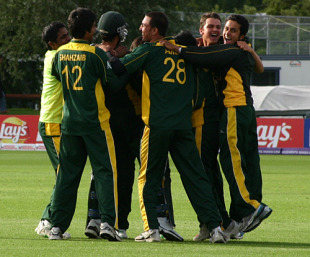 Pakistan were favourites after they had bowled out India for 114 but the early shock in their chase, when they lost three wickets for 16, immediately sparked comparisons to the World Cup final between the teams in 2006. Pakistan had emerged victors then, defending a paltry 109, courtesy Anwar Ali, whose prodigious swing toppled an overconfident India. Sandeep Sharma looked good to return the favour this time with his movement, beating the top-order batsmen consistently before bowling opener Babar Azam with a big inswinger. The effect rubbed off on his bowling partners, Saurabh Netravalkar and Jaidev Unadkat, who accounted for Ahmed Shehzad and captain Aseem Ghumman by squaring them up. On a big ground and a slow outfield, boundaries were elusive and Ahsan Ali and Rameez Aziz set about stabilising the creeping run-rate by way of piercing the field. There were intermittent hits to the fence, including a clean strike over long-on by Aziz. But the preoccupation with singles and twos led to a moment of indecision and resulted in Ahsan's run out, ending a 55-run stand. Aziz holed out the next over, swinging the game towards India but bringing the eventual match-winner Hammad to the crease. India's surge at the close of their innings was a belated one while Pakistan's, despite the frequent loss of wickets, was helped by a couple of timely bursts from Hammad's partners. With 24 needed off 17, Mohammad Waqas smashed Ashok Menaria over midwicket for six and fell the next ball. With 16 needed off 12, Usman Qadir skied Unadkat for a couple and followed up with a boundary over extra cover to bring the equation to a run-a-ball, but fell the next delivery. Amid the swinging fortunes, Hammad held firm. He hit Sharma for a six over midwicket and scooped Unadkat over short fine leg to leave Pakistan needing just four in the final over. There was a moment of trepidation when his partner Sarmad Bhatti fell to the second ball of the final over. 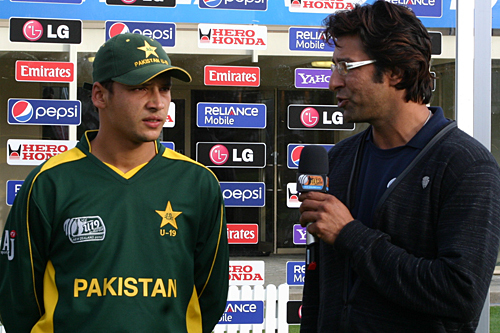 The batsmen, however, had crossed and Hammad finished the chase by cutting Sharma through point to crush Indian hopes. The Indian innings needed a repair job from Mandeep Singh, who stroked 40, to put up a score that almost proved adequate. But Fayyaz had justified Azeem Ghumman's decision to bowl by nipping out the Indian openers in the first over, and returned in the end to take two more.